The 2016 Housing Market Outlook Report is out! The RE/MAX 2016 price projection for the average residential sale price is 2.5%, based on continued demand in Greater Vancouver and the Greater Toronto Area. VANCOUVER, B.C. – December 2, 2015 – Home sales reached near record levels in November even as home listings began the traditional year-end decline. The Real Estate Board of Greater Vancouver (REBGV) reports that residential property sales in Metro Vancouver reached 3,524 on the Multiple Listing Service® (MLS®) in November 2015. This represents a 40.1 percent increase compared to the 2,516 sales recorded in November 2014, and a 3.3 percent decrease compared to the 3,646 sales in October 2015. Last month’s sales were 46.2 percent above the 10-year sales average for the month and rank as the second highest November on record for residential property sales. New listings for detached, attached and apartment properties in Metro Vancouver totalled 3,392 in November. This represents a 12.5 percent increase compared to the 3,016 new listings reported in November 2014. The total number of properties listed for sale on the real estate board’s MLS® is 8,096, a 35 percent decline compared to November 2014 and a 15.4 percent decline compared to October 2015. The MLS® Home Price Index composite benchmark price for all residential properties in Metro Vancouver is currently $752,500. This represents a 17.8 percent increase compared to November 2014. The sales-to-active-listings ratio in November was 43.5 percent. Generally, analysts say that downward pressure on home prices occurs when the ratio declines below the 12 percent mark, while home prices often experience upward pressure when it reaches 20 percent, or higher, in a particular community for a sustained period of time. Sales of detached properties in November 2015 reached 1,335, an increase of 31.9 percent from the 1,012 detached sales recorded in November 2014, and a 44.2 percent increase from the 926 units sold in November 2013. The benchmark price for a detached property in Metro Vancouver increased 22.6 percent from November 2014 to $1,226,300. Sales of apartment properties reached 1,553 in November 2015, an increase of 47.6 percent compared to the 1,052 sales in November 2014, and an increase of 60.3 percent compared to the 969 sales in November 2013. The benchmark price of an apartment property increased 14 percent from November 2014 to $435,000. Attached property sales in November 2015 totalled 636, an increase of 40.7 percent compared to the 452 sales in November 2014, and a 49.3 percent increase from the 426 attached properties sold in November 2013. 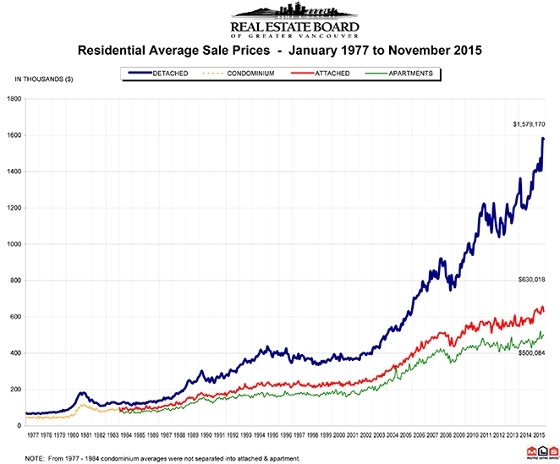 The benchmark price of an attached unit increased 11.3 percent between November 2014 and 2015 to $536,600.